Please SHARE with your Friends, Family, Co-workers, Public Safety Members and on Your Social Media Channels to help bring this Child back to his parents and community. 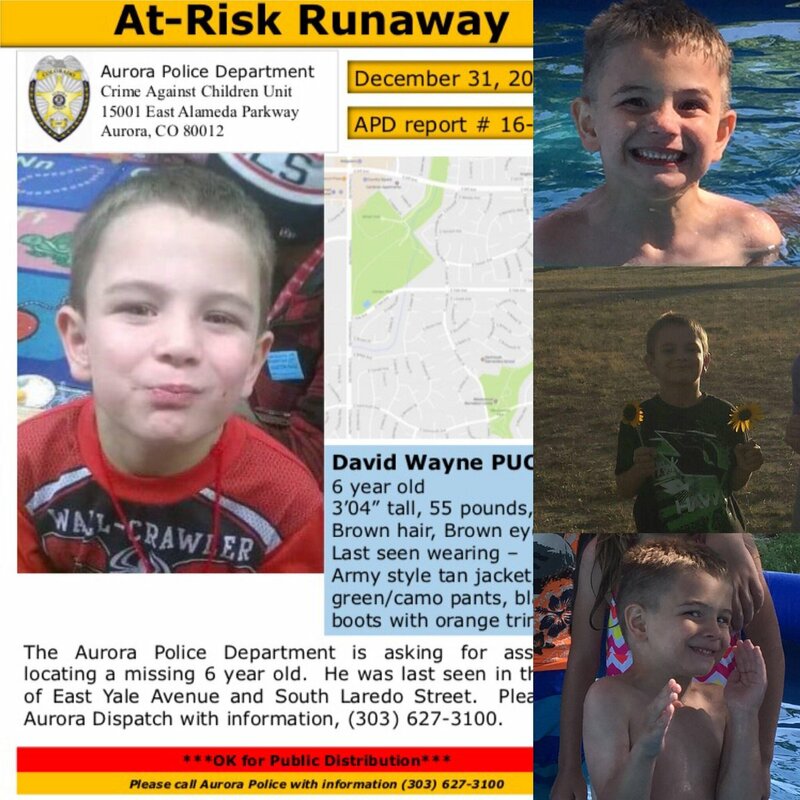 Six year old David Pucket went missing on New Year’s eve around 1745 Hours MST, Aurora Police are saying most likely he left voluntarily but are not ruling out a possible abduction from his home in the 15700 block of East Amherst Place in Aurora, Colorado. David Pucket, 6, is described as a white male as 4′, 47#, brown hair and hazel eyes. He was said to be wearing green camo pants, black t-shirt, black & orange boots and a tan coat. He is a student at Dartmouth Elementary School. | UPDATE | David has Brown eyes, not Hazel. Police urge those who may have seen this At Risk child to call 9-1-1 immediately and report all and any tips (no matter if you think it is insignificant) to Law Enforcement. See Something? Say Something. Aurora PD say this is their highest priority case and have many resources from various units and surrounding communities out looking for him. SRT, Patrols, Major Crimes, Jefferson County Bloodhound K9 Team, Denver PD Helicopter, Arapahoe Co SAR volunteers, National Center for Missing and Exploited Children (NCMEC), the FBI and Darmouth Elementary have either been deployed or are said to be part of this high priority case as resources. David Pucket is considered as an At Risk child who has gone missing (wandered off) two times before but was returned with the assistance of a concerned citizen or has gone into a store for help. Police have sent out three (3) reverse 9-1-1 calls that have expanded to a 2.5 mile radius reaching 27,000 residents within Aurora, Colorado. Police are also providing updates through their Social Media Channels, such as Facebook and Twitter. They are asking all of us to help them get the word out there by RT broadcasts, etc. Due to the unknowns in this case and criteria needed, an Amber Alert has not been issued but could if their investigation turns into that direction. Police, Volunteers, Family and other persons will be out in full force today looking to find David. Due to cold weather conditions, David was probably not dressed properly making it even that much more of a priority to find him. Ai r resources may include Drones and a Helicopter today along with a high number of ground resources. We are using the hashtag established for this missing child’s case as #FindingDavid. Please follow us on our Social Media channel (Twitter, FB) for more updates. When RT this, please use the same hashtag, so we can align all of our posts on the same page. The City of Aurora is the 3rd largest city in the State that boasts a population of 353,108 (2014 census) residents. It is 100% urban and 0% rural. It is proud of its award-winning Public Safety partners. The Aurora Police Department currently has 682 Officers with 141 Civilians. The Aurora Fire and Rescue has 346+ (2014 census) personnel working in various disciplines. It responded to 54,000 calls in 2015. They are a Department that staffs all fire apparatus with 4 personnel. There are 15 Fire Stations in the City. Firefighters are represented by the IAFF Local 1290. The weather is currently partly sunny with temps of 45*F with Westerly winds at 6 mph and humidity at 27%.